Covers upgrades for gaming, digital video, and entertainment! Want to add punch to your PC? This handy reference helps add power to your old computer. Easy steps show you how to add memory, update your virus protection, get your PC ready for Windows Vista or rev it up as a cool entertainment center capable of recording TV shows or hearing DVDs in surround sound. 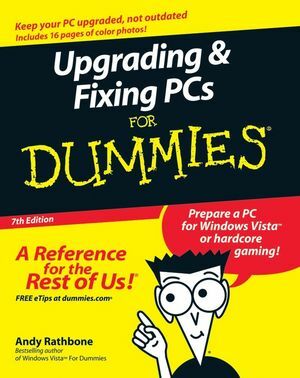 Andy Rathbone is the author of Windows Vista For Dummies as wellas previous editions of Windows For Dummies. He is also the author of TiVo For Dummies and MP3 For Dummies. Part I: Boring, Basic Repairs. Chapter 1: Start Here First. Chapter 2: Keyboards, Mice, and Joysticks. Chapter 3: Replacing the Monitor, Adding a Second One, or Connecting to a TV. Chapter 4: Choosing a New Printer. Chapter 5: Moving from the Old PC to the New One. Part II: Beefing Up Your PC for Windows Vista, Games, and Video. Chapter 6: Discovering How Well Your PC Will Run Windows Vista. Chapter 7: Beefing Up Your PC’s Video. Chapter 8: Adding More Memory. Chapter 9: Adding Storage with a Hard Drive. Chapter 10: Replacing the Power Supply or Laptop Battery. Part III: Teaching an Old PC New Tricks. Chapter 11: Fine-Tuning Your PC’s Sound. Chapter 12: Turning Your TV into a Home Theater with Vista’s Media Center. Chapter 14: Adding a Scanner. Chapter 15: Adding a CD or DVD Drive. Chapter 16: Replacing a Modem. Chapter 17: Linking PCs with a Network. Chapter 18: Filtering Out Evil with Firewalls. Part V: Introducing Parts to Windows. Chapter 19: Hiring the Right Driver for Windows. Chapter 20: Installing or Upgrading to Windows Vista. Chapter 21: Troubleshooting and Fixing Windows. Chapter 22: Finding Help Online. Chapter 23: Ten Cheap Fixes to Try First. Chapter 24: Ten Handy Upgrade Tools. Chapter 25: (Nearly) Ten Upgrade Do’s and Donuts. Appendix: The Rathbone Reference of Fine Ports.